Unless you have been saving money for quite a long time, you are probably going to be putting less than a twenty percent down payment. Not all that surprising. A first time home buyer on a $400,000 purchase would need to come up with $80,000 to put down 20%. When you got other significant living expenses and maybe some significant student loans to repay coming up with all that cash isn't easy. Most buyers end up putting less than 20 percent down. The downside of putting less than 20 percent down in most circumstances is having to pay what's known as private mortgage insurance. Private mortgage insurance is put in place for the protection of the lender. It is a form of insurance against the possibility that a buyer will default on their mortgage. Given you didn’t have the ability to put twenty percent down on the home, the financial institution considers you a higher risk and wants to be confident that they'll be covered should no longer make your payments and default on the loan. Unfortunately, private mortgage insurance can boost your monthly mortgage bill by quite a bit of money. If you purchase a home for $400,000 and you have a PMI of 1/2%, you'll be paying an extra $2000 a year in payments – or $167 a month. That is $167 a month you could be investing somewhere else or using to pay bills. The true downside is the private mortgage insurance does absolutely nothing for you. Private mortgage insurance is purely for your lender, at your expense. You get nothing out of it except getting the loan from the lender. Of course, one of the things homeowners research is how to stop paying private mortgage insurance. Getting rid of private mortgage insurance pragmatically is easy to do. All you need to do is to pay your mortgage down to 80 percent or less. Easier said than done, right? For most people getting down to the 80% level is going to take a little bit of time. 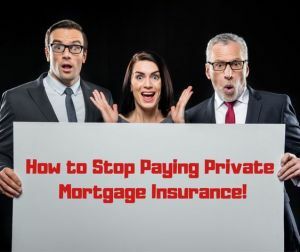 In the reference above published at Maximum Real Estate Exposure, you'll learn exactly how you can get rid of your private mortgage insurance (PMI). There is absolutely no reason why anyone would want to continue paying this insurance when they don't have to. Although lenders are required to remove PMI when you get to 78 percent equity don't expect them to be aggressively working to make this happen for you. Make sure you are proactive in your quest to get your private mortgage insurance removed. Just think about all having that extra money every month. You'll be well served to be putting it somewhere else where it makes a difference for you financially!